We’d love your help. Let us know what’s wrong with this preview of The Jeera Packer by Prashant Yadav. He was the best sharpshooter in the state. A true bullet artist. But he gave it all up to lead a happy, normal, stable life . I once changed the history of Uttar Pradesh state with a gun and a finger. One shot, one man. Right man, wrong man. But that was thirty years ago. I shot people through their heads then. I pack jeera in a basement now. To ask other readers questions about The Jeera Packer, please sign up. Magnificent characterisation, unique plot and terrific dialogs. While reading 'The Jeera Packer' of Prashant Yadav, I never felt that I am reading authors debut work. I would say I got feeling of watching Anurag Kashyap's or Vishal Bharadhwaj's movie. Story starts with an ex-gangster, who was infamous sharpshooter of his time. He has left violence 27 years back and is living peaceful like with his wife and son. He is running a grocery store in Noida with help of his wife. He packs spices speciall Magnificent characterisation, unique plot and terrific dialogs. While reading 'The Jeera Packer' of Prashant Yadav, I never felt that I am reading authors debut work. I would say I got feeling of watching Anurag Kashyap's or Vishal Bharadhwaj's movie. Story starts with an ex-gangster, who was infamous sharpshooter of his time. He has left violence 27 years back and is living peaceful like with his wife and son. He is running a grocery store in Noida with help of his wife. He packs spices specially jeera in small packets everyday. But 27 years of peaceful life has not given him satisfaction. His old time friend Abdul has made him realised that to get satisfaction he has to work on his life's job/mission. And he has self-assumed job of assassinate Chief Minister of UP. Apart from the main protagonist's part, story has another parallel in CM's political life. Antagonist CM known as Dada (through out story) wants to become Prime Minister of India. He is sole decision maker of the strongest party in UP. His cunning leadership has made sure that no one took over him in last 3 decades. His ascend to PM and plan to replace his drug addict son to CM, has started creating opposition in his close group. Apart from Jeera-Packer there are many characters in story who want to kill Dada. As story ascends carpet revealed various aspects in different color. Jeera-Packer's part of history was written in first person, while other person's part was written in second or third person. Thing that I like the most is sarcastic descriptions of various incidents and characters. From my point of view it is strictly for 16+ age group. I would like to thank the author Prashant Yadav, Vishnu Chevli & the publishers Fingerprint Publishing for providing me a free copy for an honest review and feedback. The book is a wonderful read and I enjoyed reading it thoroughly. Initially I was a bit skeptical about the book given its weird title. But as the saying goes, do not judge a book by its cover, pun intended !! The story is about a sharpshooter who has quit the life of crime some 25-odd years back and is now running a grocery shop I would like to thank the author Prashant Yadav, Vishnu Chevli & the publishers Fingerprint Publishing for providing me a free copy for an honest review and feedback. The story is about a sharpshooter who has quit the life of crime some 25-odd years back and is now running a grocery shop eking out a mundane existence with his wife and son. One fine day he decides to make his life purposeful with a singular motive of taking up his old profession. His target ? The Chief Minister ! The story is set in the Hindi hinterlands with state politics as a backdrop. It can be termed as a desi political thriller. The author seems to be inspired from real life incidents in Uttar Pradesh politics. The names of the characters are eerily similar to some of the political figures in the state. You can actually imagine and feel the politics being played out by the characters. The author also uses dry humour to engage his reader. Some of the scenes were so hilarious that I couldn't stop laughing. For example, the scene where the Chief Minister falls off the shoulders of his supporter after he is released from jail and is bitten on his foot. It’s not always that you come across a book by a debutante which makes you sit at one place in your bedroom and go on reading despite IPL running in the other room. That’s the magic Prashant Yadav’s “The Jeera Packer” does upon you! If you ask me what I did for 8 long hours- read a book or watched a movie, the way this book has been written, my answer would be- I watched a wonderful movie which never felt stretched or boring. It only made me appreciate the protagonist and become his heart and un It’s not always that you come across a book by a debutante which makes you sit at one place in your bedroom and go on reading despite IPL running in the other room. That’s the magic Prashant Yadav’s “The Jeera Packer” does upon you! If you ask me what I did for 8 long hours- read a book or watched a movie, the way this book has been written, my answer would be- I watched a wonderful movie which never felt stretched or boring. It only made me appreciate the protagonist and become his heart and understand his body language and mental state in each and every page. I have not read many political thrillers but reading this one makes me want to read from Prashant Yadav only as I do not think any other writer can do such justice to the genre. If there’s any, do let me know. The writing style is intriguing which makes you turn page as fast as you can. The book didn’t have much twists and tales but yet, it made you watch out for what is going to happen next. The characterization is so beautiful and perfect that even when a character disappears and reappears after 50 or so pages, you remember him clearly. For few characters, you just desire them to appear as soon as possible as you want to know what their thoughts are at this point of time in the story. The best part of the writing style of Prashant Yadav is the way he has narrated the story of protagonist as first person while switched to second and third person for narrating the sequences taking place with other characters. I also liked how the two different scenarios are integrated in middle of the story with a plan that protagonist decides as his ultimate goal of life. The first half of the book is little slow but it is mostly spent in developing the characters hence it is also fun in reading as we get to know a new person every now and then. The backdrop of each personality is described in detailed so that the reader gets to know why they take a certain step later in the book and do not find it weird. The background of Uttar Pradesh is also treated perfectly and very well in the book. I, being from North India, could really relate with many parts of the story. It also made me remember the movies like Wasseypur, Revolver Rani etc. The family of both, the protagonist and the CM, is very nicely maintained throughout the book. The pre-climax is very nicely treated as author closes down each and every chapter intelligently making it sure that he does not miss out on something. The climax is predictable and not that boomerang but still it makes you smile that the protagonist did not have to go through the kind of severity you kept predicting since the start of the book. The humor level in the expressions of the characters during few scenarios does refresh the mind of the reader who is awaiting a thrilling scene. Another treatment for which I would specially like to quote author is for the character of Lal Mani. What an incredible work done on this part! Overall, this is a book that can really enrich your mood. I give it 4 stars out of 5. In past few years , I have seen that majority of debutant Indian authors pick up a love story as their debut novel . This has become almost a ritual after the success of novelists like Durjoy Dutta , Nikita Singh , Ravinder Singh , the latest Amozon.in sensation - Savi Sharma and obviously their father-figure , Chetan Bhagat . Most of these novels are simple (moreover garbage) love stories , the premise of which consists a boy meeting a girl , they become friends , than best friends , than love In past few years , I have seen that majority of debutant Indian authors pick up a love story as their debut novel . This has become almost a ritual after the success of novelists like Durjoy Dutta , Nikita Singh , Ravinder Singh , the latest Amozon.in sensation - Savi Sharma and obviously their father-figure , Chetan Bhagat . Most of these novels are simple (moreover garbage) love stories , the premise of which consists a boy meeting a girl , they become friends , than best friends , than lovers , than something happens between them , they break up and in the fairy tale ending they patch-up and live happily ever after . And in case if the debutant realises that his/her novel is a utter thrash , which he/she has created with lot of hard work , which constitutes searching quotes from Tumblar and lines from a popular song . Then the debutant creates a great marketing gimmick , including if you give an honest (positive) review to the debutant's novel , the debutant will talk to you personally . These all cheap gimmicks work and the debutant becomes the Amozon.in bestseller. Prashant , man you should be awarded some bravery prize for picking up such a subject in a time when people are busy in reading these garbage love stories. The book 'The Jeera Packer' is a wonderful debut . The book his gritty yet witty and insightful . The book gets inside you and asks - What is your "Taj Mahal" ? The book has rawness and rustiness which Anurag Kashyap's "Gangs Of Wasseypur" had . It also had the political intrigue which Vishal Bhardwaj's "Omkara" and Tigmanshu Dhuliya's "Saaheb Biwi And Gangster" duology had and those killing one liners throughout the book are fabulous . The author did a great job in character building and used each and every character aptly . The situation building was very good . The pace which was pretty good from the start slows a bit down towards the ending . But the ending is completely unpredictable and steals the whole show . I would have read this book in a day, but due to work exigencies, I finished reading The Jeera Packer in two days. Oh, boy! Did I like it? I loved reading this book as I was hooked to it right from the word go! The main protagonist is an ex-sharpshooter who now lives a clean regular life with his family. He is not happy with his mundane life as something within him has died. He decides to reignite the passion in his life and works on a mission to kill the Chief Minister, who incidentally is his b I would have read this book in a day, but due to work exigencies, I finished reading The Jeera Packer in two days. Oh, boy! Did I like it? I loved reading this book as I was hooked to it right from the word go! The main protagonist is an ex-sharpshooter who now lives a clean regular life with his family. He is not happy with his mundane life as something within him has died. He decides to reignite the passion in his life and works on a mission to kill the Chief Minister, who incidentally is his boss from the gangster days. The CM has prime ministerial aspirations and wants his drug-addict son to replace him. His inner circle is certainly not happy with his decision and a few of them plan to kill him as well. Who is successful in killing the CM and what’s the modus operandi… well, to know that you need to read The Jeera Packer. 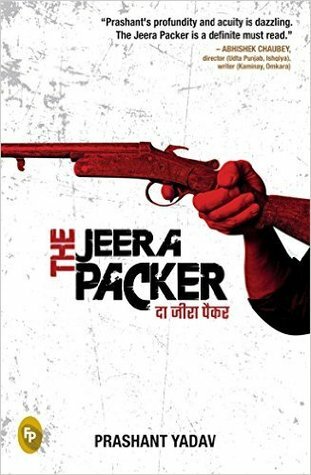 The Jeera Packer is a contemporary political crime thriller. The characters, plot, setting, events, language mirror real life. The Jeera Packer has multiple characters in multiple settings living out multiple plotlines, as they engage in power, politics, manipulation, violence, betrayal, greed, desires and deceit. All these multiple subplots are interconnected and are woven deftly into the main plot which not only moves the story ahead at a faster pace but also engages the reader. I liked the way the characters are introduced in the story. There is no information overload about the various characters. It’s interesting to find details of the various characters bit by bit. And all the while the reader in me was trying to figure out who they really are and what makes them tick, what secrets they’re hiding… And that’s certainly stimulating and adds to the intrigue. The dialogues are smooth and natural and the language is simple and lucid. The book is high on humor, sarcasm and witty one liners. The twists and turns in the story are handled really well. All in all, The Jeera Packer is a perfect balance of action, drama, and intrigue. If anyone is thinking of making a movie based on The Jeera Packer, I’d vote for it. The Jeera Packer is a fantastic page turner and is highly recommended. Well Done, Prashant Yadav! Well Done!! Prashant Yadav's book The Jeera Packer is a story of a man who lives a simple life and works at a store. Everything around him changes because of a few encounters and events. Politics, power setup, manipulation and corruption fill up the narrative. The action is fast-paced and the language is rich. I did have a problem with the portrayal of women characters in the book. There is a streak of misogyny in the narrative. Women are being constrained to stereotypical roles. They are mostly described u Prashant Yadav's book The Jeera Packer is a story of a man who lives a simple life and works at a store. Everything around him changes because of a few encounters and events. Politics, power setup, manipulation and corruption fill up the narrative. The action is fast-paced and the language is rich. I did have a problem with the portrayal of women characters in the book. There is a streak of misogyny in the narrative. Women are being constrained to stereotypical roles. They are mostly described using sexual language and their role is mainly to please men. WHAT?? This was exactly what I felt after finishing this book. I didn't expected this end at all and it just made me think, what just happened? Is it true or just my mind is blabbering and expected this end? This was my first political/crime/thriller and this book did proper justice with the genre. I won't say that it kept me fascinated or hooked from the very first page, rather the truth is opposite. It took me really long to get a grip on the story. After reading a few chapters in the starting, I felt as if I am watching a typical Bollywood crime drama and nothing is different. And I also thought, at one point to DNF the book, but I am glad that I didn't and finally completed it. The story starts with our main character who happened to be a gangster/sharpshooter some 35 years ago and now he is a shopkeeper who packs Jeera (hence the title) and lives a simple life with his wife and son. But wait, what was his name? Did I missed it or was mentioned somewhere? After the realization of his dream, he decided to return to his old job, the sharpshooting, for once and all, for killing the CM. This is the part that I failed to understand and took the rating down. I can't understand why the hell he even decided to kill the CM in just a flash and declared it as the moto of his life, which was rather going simple? Nevertheless, the story is about how he did it or planned to did it, how the political rifts are happening between Dada and Lal Mani, his brother and son, and hw the conditions changed. The best part of the book was characterization. All the characters were developed really well and are well written. You can tell enough details about each of them after finishing this. The story telling was also simple and was written in simple language. But there was too much use of abusive language (obviously to make the plot real) so it is strictly recommended for 16+ age groups. There were some great dialogs written, which made the situations humorous sometimes, and also made you think. "Missed chances do not hurt just you but everyone connected to you "
If you will read it with full attention and if you are a big fan of Bollywood crime movies, then you would really feel as if you are watching a real movie. This is a perfect choice for Bollywood fans. The first half was slow for me and was not interesting that much, but as the story progressed and reached towards the end, it just got exciting, and the end was just out of the blue. Thank you Prashant Yadav, Vishnu and Fingerprint! publishing for providing me this book. The story centres around a man who works as an ordinary shopkeeper, packing jeera and other groceries to be sold in his shop, which he co-owns with his wife, Jaya. But his ordinary life changes when he meets Lal Mani, his former aide, who reminds him of his dark past. The jeera packer once used to be a sharpshooter who was known for never missing his targets. But for the love of his wife and son, he quits the world of crime and returns to a normal life. Lal Mani, however, goes on to become the state’s Home Minister and a right-hand man of the Chief Minister. Learning about his riches and position, the jeera packer feels jealous and worthless about himself. He then decides to do something big in life, which would help him recover from the frustration and depression he has been experiencing all his life. Soon after, he discovers that the big mission of his life would be to kill the corrupt and evil Chief Minister, who has been silently killing and sucking the good out of the people of the state. Once convinced about his goal, he starts making plans and actions in that direction. However, unknown to him, there are many more enemies of the CM who are after his life in order to inherit his power and wealth after his death. Thus begins the deadly game of power, betrayal and killings. The author has maintained an easy style of writing throughout the book, which perfectly personifies the political situations in most Indian states. Set in the backdrop of northern India, a lot of local and swear words are used, which make the conversations sound real. For those who love political thrillers, this is a great read! It is full of mystery and thrill, as well as drama and action that serves as a complete package, similar to a Bollywood movie. So if you would like to know about the dirty games of politics, go for this book! An interesting political thriller which has every possibility to become a Bollywood thriller. Every scene was detailed brilliantly and could be visualized easily. Liked all the characters and how the plot was weaved around them. The story was balanced well and every character's track was narrated in an interesting manner. The climax was a shocker and unexpected but liked the twist though really wished to know what happens to the real master mind of the murder. Superb book for all action, fast paced readers. Fast paced, action thriller book. A deep story-line, recommended for those who love action books. Cover is excellent worth buying. Beautifully designed with precision. Title is one of its kind, unique and worth challenging to the minds of the readers. Story is something from being ordinary to something revolting. How life changes in every way and how things force us to choose some extreme steps in different situations. Beautiful masterpiece, worth readin Superb book for all action, fast paced readers. The Jeera Packer by Prashant Yadav is a gripping political thriller. Reading this book was like walking on an undulating surface. With a complex plot, a number of twists and turns and non-stop thrilling action, the book kept my eyes glued to the pages. The author has done an excellent job of not only setting up a solid plot, but also building memorable characters around this plot. At the same time, this book isn’t really about plot twists. On the other hand, it is about some of the unique nuance The Jeera Packer by Prashant Yadav is a gripping political thriller. Reading this book was like walking on an undulating surface. With a complex plot, a number of twists and turns and non-stop thrilling action, the book kept my eyes glued to the pages. The author has done an excellent job of not only setting up a solid plot, but also building memorable characters around this plot. At the same time, this book isn’t really about plot twists. On the other hand, it is about some of the unique nuances of Indian politics, Indian judiciary and Indian administrative systems. The major strength of this book; however, is the peek into the Indian political world; a world fuelled more by ambition rather than true devotion to political ideologies and goals. You find almost all the elements of Indian politics in this book. The story revolves around an ex-gangster, a well-known sharp shooter of his time. After leaving the life filled with violence 27 years ago, he is now living a peaceful life with his wife and son in Noida. He and his wife are running a grocery store successfully. However, he is not happy with his monotonous life. He finds himself unsatisfied. He finds his life unfulfilled. His old life is calling him back. He is missing his gun. Shooting was his passion and he keeps whining about it in his mind constantly. Then it just hits him. While he cannot start killing people again, killing an influential evil person and getting away with that will calm down his mind. It will not only quench his thirst of killing, but will also make his life a fulfilled life. Killing such a person would be a good feat, he rationalizes. He decides to assassinate Chief Minister of UP, an evil person in his eyes. But, he is not the only one. There are a number of other people who want to kill Chief Minister. So, what happens next? Well! You have to read the book to know that. I found The Jeera Packer to be a really enjoyable and fun read. Prashant Yadav hits all of the right notes about the culture and dynamics of UP politics. He is a very engaging writer with a keen eye for plot. The book has a steady pace. The book has an interesting cast of characters and it was fun spending time with these characters. Though I liked almost all the characters, the character of the main protagonist truly stands out from the others. His character seems to have been snatched from real life. His character is done with honesty and readers will stand with him in his every step. His inner conflict, nevertheless, could have been portrayed in a more meaningful manner. This, according to me, is a lost opportunity. While the writing is excellent and prose is stunning, the editing could have been tighter. A number of simple grammatical mistakes could have been avoided. However, these grammatical errors didn’t really interfere with my enjoyment of the book. Here are some of the nice The book is definitely a good thriller. Most of the Indian readers can draw parallels with many political incidents. The writer have the skills to write convincing thrilling events and explaining scenes. "because the prince could do no wrong. Just like the king could do no wrong." He took the backdrop of North-India, where politics is at it’s peak. By staying there he have witnessed many things through local newspapers, Bollywood movies, and personal experiences. He have then crafted them well in the form of a novel. The marriage of underworld and politics is written effectively in this book. The only problem stays with the book is usage of abusive words/phrases and portrayal of steamy scenes. Of course, the author have his vision of reality, and he could have done it to justify that. It however makes the book’s target audience to be the adult readers only. If this was not the case, we happily have given one more star to the book. The Jeera Packer by Prashant Yadav, is the story of a who was one of the best sharp shooters during his youth but settles into an ordinary life with a wife, a kid and a shop. After twenty or so years of leaving behind the life of a gunman, is suffering a mid-life crisis and looking for a way to break the monotony of his day-to-day life and boost his depleting self-esteem. Coincidentally, I was reading the book right around the time when the whole of North India was talking about the elections in The Jeera Packer by Prashant Yadav, is the story of a who was one of the best sharp shooters during his youth but settles into an ordinary life with a wife, a kid and a shop. After twenty or so years of leaving behind the life of a gunman, is suffering a mid-life crisis and looking for a way to break the monotony of his day-to-day life and boost his depleting self-esteem. A good attempt at writing a mystery/thriller but very slow progressing, plot could have been more intricate and gripping but still a good book, satisfactory read! If you are wondering what a nice little “desi book “ is then pick up Jeera Packer. I was amazed as to how the book was a vivid and kaleidoscopic picture of true UP culture. A lot of Indian books try to tell indian stories but almost all of them are too influenced and inspired by western culture that they fail to portray the true indian flavours in their story. This book completely impressed and shocked me as to how from the very first page to the very last remained completely indian in nature without trying to modify it into western aesthetics. The result is amazing. Hence why they say stick to your true self. The language and narration is all true “UP bhaiyya” style. Lots of local slangs and UP culture bleeds over the words and pages, giving it a distinctive appeal. One of the things that did shock me was the abundance of cuss words. One hand i am amazed at the boldness of the author and on the other hand i feel like i should go to church and either confess or baptize myself. Either way it will completely depend upon your taste as to how you take the book. The book stands true to its theme and those who pick it up should know that the content, language can all be pretty graphic and bold to digest at one go. But once you overlook that uncomfortability you will see a bollywood masala thriller boiling underneath the book which is completely entertaining and a fast paced adrenaline rush. #blurb : The best sharpshooter in Uttar Pradesh...now took retirement in an urge for a simple life with his family. He works as a jeera packer...but he is now doing a comeback in shooting just for one final work—to shoot the chief minister. Will he be able to brush away the jeera dust and rediscover himself? Or has the middle-aged family man already throttled the sharpshooter in him? #WRITING_N_NARRATION : This political thriller contains dark humour and satirical verses. Writing and language of the book is pretty lucid...but for me the narration was a bit slow in the beginning..but once you are through 100 pages...you will not be able to put it down. #CHARACTERS : Through the characters author has successfully depicted various dark realities of the political world.. characters are very well presented ..thus indeed complementing the story! This review has been hidden because it contains spoilers. To view it, click here. I don’t remember the last time I had such fun reading a book. I would love reading it in Hindi – the story deserves to be told in that language. What I liked about the book: the sheer pace, the plot, the crazy twists and turns, the humour, and the fact that there is no preaching, no patronizing, and no pandering to an ‘international’ audience. - Who were the people in the M I don’t remember the last time I had such fun reading a book. I would love reading it in Hindi – the story deserves to be told in that language. -	Who were the people in the Mala jungle - naxals? Why was this twist introduced at all, seeing it didn’t amount to anything? -	Who did kill Madhurima? Was it the CM’s doing? But then Lal Mani is so sure that a malfunctioning lift wasn’t his style? So was someone else behind that murder? And, this may be the prude in me talking, but I felt that the story could have done without the ‘item numbers’. It would have worked just as well. The story revolves around the politics and its cruelty which is believable and realistic. Backdrop of UP (Uttar Pradesh) adds the extra color to the political thriller. The plot surprises with twists and turns which engrosses the readers till the end. Funny and thoughtful dialogues have been peppered throughout the novel to keep the brain occupied. Though the protagonist is a gangster, he impresses the readers. The equally contributing character in the chief minister gives us the insight into the The story revolves around the politics and its cruelty which is believable and realistic. Backdrop of UP (Uttar Pradesh) adds the extra color to the political thriller. The plot surprises with twists and turns which engrosses the readers till the end. Funny and thoughtful dialogues have been peppered throughout the novel to keep the brain occupied. Though the protagonist is a gangster, he impresses the readers. The equally contributing character in the chief minister gives us the insight into the politics. The characterization was great and the detailing of each character was done with perfection. Few characters might live in our hearts till we finish the book. Prashant hasn’t pained the readers with too many characters to remember which acts in favor of the novel. After a slew of romantic novels that Indian writers debut with, a political/crime thriller is a breath of fresh air by Prashant Yadav. He builds out all the major characters well , I wonder if they have been inspired by some real people we know on the political scene, but well paced and structured. Most of the characters get a lighter shade of grey in this world of black and white as they push forward their political juggernaut. If there was a fault with the book, then the ending was a bit of a After a slew of romantic novels that Indian writers debut with, a political/crime thriller is a breath of fresh air by Prashant Yadav. He builds out all the major characters well , I wonder if they have been inspired by some real people we know on the political scene, but well paced and structured. Most of the characters get a lighter shade of grey in this world of black and white as they push forward their political juggernaut. If there was a fault with the book, then the ending was a bit of a let down. Felt like author had run out of pages and had to wrap up quick. The level of detail was quite engrossing and the book had good humor (the pick for me was when Kranti was almost stopped due to gas getting over :-)). I am not an avid reader, especially of fiction. However, found this book very entertaining and found it to be a nice take on the Indian political class and the many tussles within that. A good political thriller. My husband recommended this book to me and I am glad I read this one. Over all, a political thriller that mirrors the cotemporary reality of the nation in the background of a Jeera Packer, it is a good read. Approach with it with no prejudice. I once changed the history of Uttar Pradesh with a gun and a finger. One shot, one man. Right man, wrong man. I shot people through their heads then. I pack jeera in a basement now. THIS IS ME, AND HERE IS MY STORY. He was the best sharpshooter in the state. A true bullet artist. But he gave it all up to lead a happy, normal, stable life…with his loving wife and dear son. And that proved to be his undoing. Resonant and deeply affecting, The Jeera Packer is the gripping tale of a man who after two decades of playing the happy family man returns to his profession of old for one final act–to shoot the chief minister. Convinced that this is his raison d’être, will he manage to pull off this one last act, as his concluding hat tip to the man he could have been? Will he be able to brush away the jeera dust and rediscover himself? Or has the middle-aged family man already throttled the sharpshooter in him? Wicked. Funny. Gets inside you and asks you what you really want in life. — as said by Navdeep Singh, the director ofAnushka Sharma‘s first home-production film,NH10. And I totally agree with Navdeep. From the beginning itself, The Jeera Packer gets a grip on you that lets itself loose only in one or two places and that is no minor feat. The Jeera Packer is gritty, violent, funny with a crooked-wicked sense of humour, and there are some rare elements of light in it–the central character’s family. Almost everything. From the opening words to the closing sequence. There was just one missing link in this otherwise perfectly crafted thriller–why choose a person the likes of a CM? Other than that, there’s no bumpers in this book. No typos. No grammatical errors even! Yeah, it was candy-land for me while reading it. Overall, The Jeera Packer gets a 4.5/5 from me; meaning it’s almost near excellent. the main realization hit at the end of the book. The Jeera Packer was highly used just to make some realizations at the end. Then why he was decorated way beyond the requirement, well that’s how the thriller works. I was not very impressed by the end, rather I was amused. The second book by someone I know personally, within a six month time frame and it makes me proud of the people I know. The Jeera Packer is a taut and engaging thriller about a retired assassin living the mundane life of running a grocery shop. But as is expected, his past revisits him and starts having its own influence on his present. The story has substance and the pace of delivery has just the right amount of pull to keep you engaged without threatening to leave you behind if you don't catch The second book by someone I know personally, within a six month time frame and it makes me proud of the people I know. The story has substance and the pace of delivery has just the right amount of pull to keep you engaged without threatening to leave you behind if you don't catch up. There is a certain amount of influence from Bollywood crime thrillers, but again, Bollywood thriller plots are often made from real life crime stories. The characters are well balanced, miles apart from each other in personality, and yet have their own style of plotting against each other which have subtle similarities. Most of the characters have been portrayed realistically, from Lal Mani to Dada, from Ventilator Baba to Abdul and both the key female characters Jaya and Madhurima have been painted with the quintessential characteristics of a strong woman; intelligent, attractive and shredded in mystery. The dialogues are terrific and even thought provoking at times, the analogies are sharp & witty and the one liners can easily be used in popular movies. The mix of Hindi and English narration makes it even more natural a reading for Indian readers (Non-Hindi speakers might struggle a bit on this though, but the essence of UP and its crime story, cannot be realistically depicted by English alone).